The Aborigines in the Northern Territory of Australia have developed a gambling card game called Kuns or alternatively called Bayb Kad. This game falls into the category of comparison card games like poker and blackjack. To play Kuns, simply remove the face cards (King, Queen, and Jack) from a standard 52 card deck. The result is a deck of 40 cards. In this deck, an ace count as one rather than as 11. Kuns is a gambling game in which a player tries to finish with the best hand in order to win a pot that builds progressively over the course of the hand. Initially a dealer is chosen, and after each hand the deal rotates to the left. Each dealer has the option of setting the ante or bet. The dealer deals two cards to each player and sets the initial bet. Players may either contribute to the main pot, paying the amount the dealer set as the ante in order to continue, or a player may discard his or her hand and not pay the ante. A player who has discarded has no stake in the main pot and will not play until the next hand. After the initial cards are dealt and bets have been made, the dealer deals out two more cards, and players must pay the ante again to the main pot in order to stay in and see a fifth and final card. After all bets have been made, the dealer deals out one final card. After the final card, one may make the same bet or discard the hand. Whoever still remains and has the best five-card hand at the end gets the main pot. 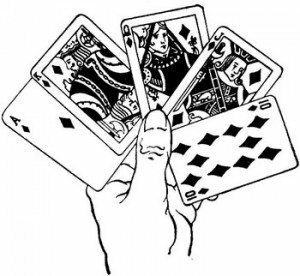 In order to have the best hand, a player must have three cards that add up to a multiple of 10. These are called the kuns. The remaining two cards are summed together and whoever has the highest final digit wins. If the two cards summed together after the kuns is a multiple of ten, that will beat any other sum. In the event of a tie, the pot is split between the tying players. A player must have at least one kun in order to compete for the final pot. If none of the players have a single kun, then all players sum up the five cards and the one with the highest last digit in that sum wins. For example, if a player holds 8,5,9,7,A then they can add up three cards to reach kuns: 8+5+7 = 20 and have the 9 and A left over to form the maximum score of 10. It does not matter how many kuns your three cards make, so long as they make at least one kun or no other remaining players can make a kun either. Regardless of how many kuns you make with your first three cards, the sum of your final two cards must have its final digit higher than the other player in order to win. For example, if one player has 10, 10, 10, Ace, 4, and another player has 10, 5, 5, 5, 4, the second player will win. The first player has 30 for the kuns portion (3 kuns) but the sum of his or her last two cards is 5 (which would also be the final digit). The second player only has two kuns from his or her first three cards, 10+5+5=20, but the last two cards equal 9, which is higher than 5. If the sum of the final cards in a players hand is greater than ten, you use the last digit to compare to other players’ hands. For example if a player holds 10, 7, 3, 5, 6 then his first three cards will make two kuns (10+7+3=20) and the last two cards equal 11 (6+5=11) but for comparison purposes, this player is only showing the 1 as the last digit of 11. If someone else had 10, 5, 5, Ace, Ace, this second person would win: (10+5+5=20, 2 kuns) and (A+A=2); 2 > 1, so player 2 wins. Both the players that are in the hand and those who have dropped out may make side bets with each other throughout the different phases of the game. All side pots and the main pot are collected by the winners at the end of each hand. Game play continues until players decide not to play anymore.